Norwich University’s 2017 Residency Conference was another rousing success—not to mention an opportunity for unprecedented personal growth and discovery. Residency Week represents the culminating experience of students’ academic careers, where they showcase their education via capstone projects, presentations, and real-world exercises that offer practical applications for everything learned in the classroom. The College of Graduate and Continuing Studies is a proving ground for leaders and pioneers—from faculty and staff to students and alumni—and is home to some of Norwich’s most invigorating experiential learning exercises. As Norwich nears its bicentennial celebration in 2019, the opportunities offered at Residency Week have continued to grow. 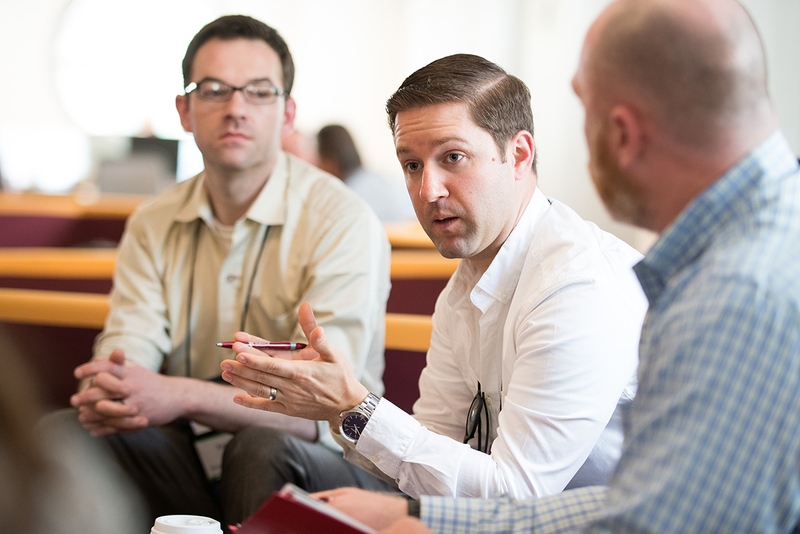 Back for its fifth year, the Norwich University Leadership & Change Institute’s Leadership Summit once again sparked rigorous collaboration amongst attendees. Participants had the opportunity to mine their collective knowledge and experience in order to crowdsource leadership solutions for institutions facing organizational challenges. Student participants were able to apply theories of meaningful leadership to real-world practice, whereas participating organizations received diverse perspectives on and innovative remedies for their respective challenges, thereby strengthening the relationship between Norwich and the professional community. The program directors for the Leadership & Change Institute are currently planning the 2018 edition of the Leadership Summit, with an eye towards expanding its accessibility and enhancing the breadth of topics and activities therein. If your company is interested in participating, visit online.norwich.edu/lci. For graduates of the College of Graduate and Continuing Studies, case studies are a fixture of Residency Week. For students in both the Master of Public Administration and Master of Science in Information Security & Assurance (MSISA) programs, case studies covered the legal, ethical and professional mores of emerging disciplines in commerce, public policy and services, and information technology. Topics of study included liability and safety concerns unique to the rise of autonomous vehicles; transparency in the healthcare system; the ways in which racial and cultural bias often inform decisions in public policy and how to rectify this behavior; and the increasingly complex legalities of drone ownership and operation. The Master of Arts in International Relations and Master of Arts in Diplomacy programs undertook a number of case studies as well, focusing on the ethics of diplomatic leadership and strategic decision making. The questions posed by these case studies were fraught with moral impossibilities; the exercises were united by the common theme of asking, when two or more outcomes may seem equally unconscionable and bear distinct consequences, what is the “right” choice? Moreover, how does one arrive at this conclusion? In this way, the diplomatic case studies were less about finding an unimpeachably “correct” answer and more about analyzing all possible outcomes and justifying how and why one might make a particular decision. Students in the Master of Business Administration program, meanwhile, received a rare and valuable opportunity to display their business acumen in the service of a pair of legitimate Vermont companies. Citizen Cider and Red Hen Bakery graciously agreed to give Norwich MBA students a look at the inner workings of their businesses in exchange for a thorough assessment of their business practices. Students began their research weeks ahead of the Residency Conference in order to gain a holistic understanding of the participating businesses; upon arriving at Residency, the students attended presentations from the companies and asked probing questions aimed at mining further information about these businesses’ practices. At the end of the process, students presented their findings and recommended approaches with which Citizen Cider and Red Hen Bakery could improve their business models. Much like the MSISA program’s Hack-a-thon exercise, the MBA case studies provided students a platform with which to apply their education in a real world setting, while simultaneously strengthening Norwich’s relationship with the community. In addition to celebrating graduating students’ hard work and success, the College of Graduate and Continuing Studies honored two graduates at the beginning of Residency Week. The William Saunders Award was instituted in memory of William “Bill” Saunders, a respected instructor in Norwich University’s online MBA program. During his fourteen years with Norwich, Saunders was instrumental in developing course offerings and led the vanguard in securing accreditation from the Project Management Institute for the MBA and MSISA Project Management concentrations. The award was designed to recognize students who exemplify Saunders’ commitment to excellence in project management. For his phenomenal work in the Project Management concentration in the Master of Business Administration program, Robert J. Berdanier was named the inaugural recipient of the William Saunders Award. In addition to the presentation of the William Saunders Award, the College of Graduate and Continuing Studies conferred the Alumni Award on a distinguished alumna. The Alumni Award is reserved for Norwich graduates who have demonstrated outstanding achievement in their careers, unparalleled service to Norwich University and a commitment to community service. This year, the Alumni Award was presented to Susan Fertig-Dykes, a retired communications and human resources management professional and 2009 graduate of the Master of Public Administration program. During her storied career, Ms. Fertig-Dykes worked as a Team Leader at The United States Agency for International Development, where she managed a unit of democracy experts who advocated for the development of independent media, civil society, rule of law, good governance and anticorruption, free and fair elections, and other democratic principles and practices in the former communist countries of Europe and Eurasia. Ms. Fertig-Dykes currently serves on the College of Graduate and Continuing Studies’ Board of Fellows Visiting Committee and provides valuable insight as to how Norwich can expand its offerings and create more opportunities for students to have local, national and global impact. With the 2017 Residency Conference squarely in the rearview, the faculty and staff of the College of Graduate and Continuing Studies look forward to building upon this year’s experiences as we help usher in Norwich University’s bicentennial—and beyond.